An important thing to remember is that fallout does not refer to radiation itself but the means by which radiation is spread. The term fallout has even been used to refer the ash falling out of the sky after a volcano eruption. 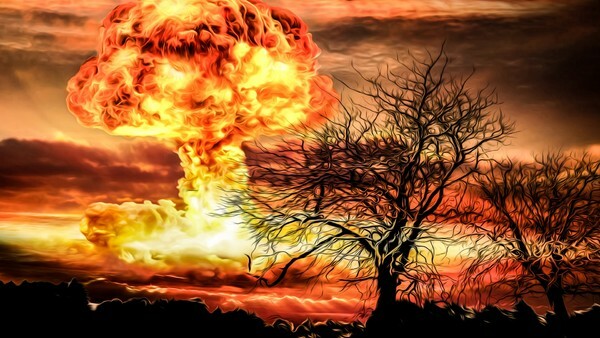 Nuclear fallout refers to the particles that are made radioactive by blast of a nuclear explosion. These particles can be made up, depending on how close they were from the centre of the blast, of soil, general debris and the material used to make the device that caused all the mess. It's basically the first thing to worry about after a nuclear bomb goes off, if you're still alive to know what's going on anyway. Some of these particles will be thrown upward by the initial force of the blast and will eventually fall back down to the surface, thus the term 'fallout'. The visible fallout will generally appear as ash or soot falling post-boom. There are three kinds of fallout: local, tropospheric and stratospheric. Local is very intense and relatively short-lived: generally the closer to the centre of the explosion, the faster poop's going to come down. The other two types of fallout are tropospheric and stratospheric which tend to be made up of finer particles higher up in the Earth's atmosphere, spread over a greater area and take longer to actually fall back down to the surface.